“Gentlemen, start your engines!” is our tribute to the hit movie, Cars. With Cars 2 coming out this summer, now is the perfect time to brush up on your knowledge of all the characters and crew! Find Lightning McQueen, Sally, Mater and all the crew in this fun word search. 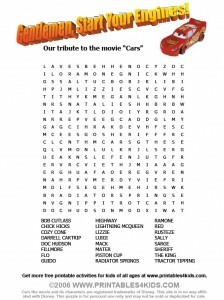 Click on the image above to view and print the Cars movie word search full size or download our printable Cars word search as a PDF file.